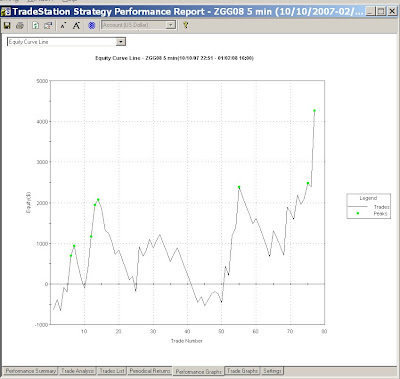 This system for ZGG08 uses a Bollinger upper band breakout as the first condition. Other conditions are data1 MACD (positive fast slope) and data2 MACD (fast above slow) for bullish trend confirmation. It is used on a 5 min and a 45 min chart. The long position is covered on 45 min MACD cross-below signal. Stop is set arbitrarily at \$180. Trailing stop is (\$400, 63%). The problem this Bollinger breakout system is that there is a likely chance that the breakout is a sign of exhaustion. The accuracy of the entry is merely \~44%. Although the multi-time frame MACD could confirm the existing trend. Something needs to be done to identify possible trend reversal at the Bollinger upper-band breakout.